Heat coals or gas grill for direct heat. In small bowl, mix all lemon mayonnaise ingredients until well blended. Cut bread horizontally in half. Drizzle 1 tablespoon of the oil over cut sides of bread. In small bowl, mix remaining 1 tablespoon oil, the lemon peel, soy sauce and lemon pepper seasoning. Rub both sides of beef with oil mixture. Cover and grill beef over medium heat 8 to 9 minutes, turning once or twice, until desired doneness. Add bread, cut sides down, for last 2 minutes of grilling or until toasted. Spread mayonnaise on bottom half of bread. Cut beef crosswise into thin slices. Layer lettuce and beef on bottom half of bread. Add top half of bread; cut crosswise into 4 sandwiches. 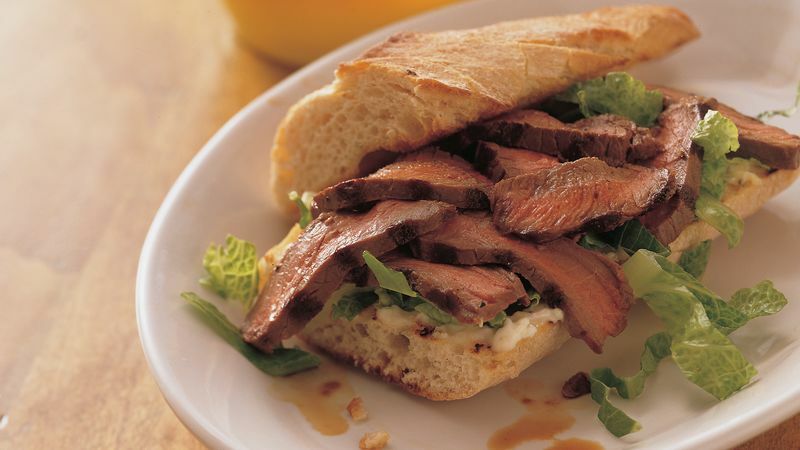 Serve these hearty sandwiches with deli potato salad and fresh tomato slices. Top off the meal with fresh strawberries and whipped cream. One medium lemon will yield 1 to 2 tablespoons of peel. Grate the lemon peel carefully so that you use only the yellow part of the skin and not the bitter white pith that is underneath.